An Oakland, CA activist says local police officers sent surveillance footage of him participating in a protest last week to his employer, resulting in his firing Monday. The activist, who goes by @Anon4Justice on Twitter, tweeted the details Monday morning in what appears to be police use of surveillance footage in combination with private and public records that identified @Anon4Justice and led to his employer. The activist had called in sick to work Friday to take part in a protest of Urban Shield, an expo for SWAT teams, military contractors and police officers from all over the world. 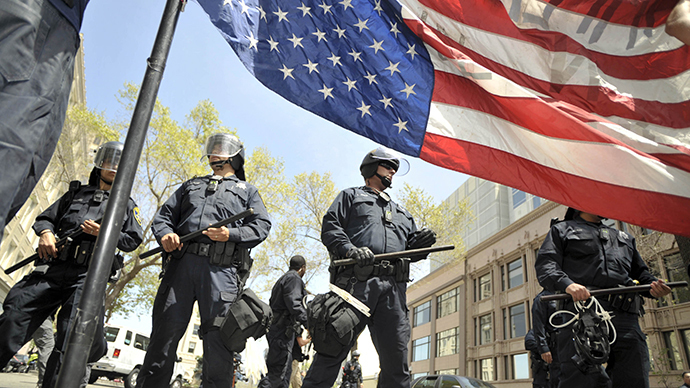 Urban Shield, coordinated by the Alameda County Sheriff’s Office, exists under the guise of fighting terrorism and “disaster preparedness” in heavily-populated areas. The event is partly a trade show for a myriad of militarized tactical gear and weapons, but there are also training exercises and war-game competitions that teams from California to Guam to Qatar took part in over the weekend. The exercises include protest suppression techniques and SWAT-team-raid simulations. As the activist protested the militarized police event, paid for by the Department of Homeland Security, Oakland police produced surveillance footage of his participation in the demonstration and photos of his truck, which they sent to the his employer. The police called the employer, as well, to tell them though he said he was out sick, he was really taking part in a protest, which led to his firing. I just got fired from my job due to calling in sick to go to Oakland #urbanshield rally Friday. The Oakland police called my company and lied to them about my truck being involved in a hit and run. 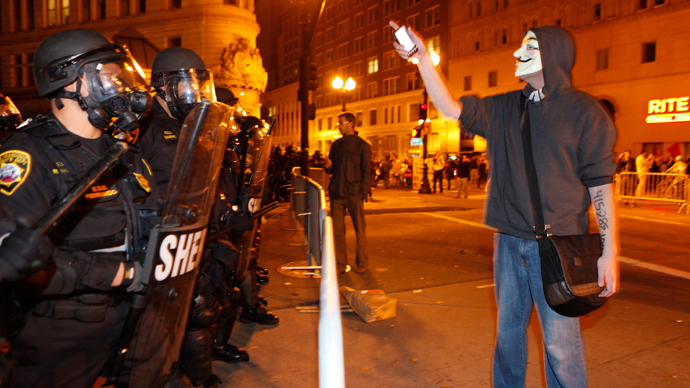 The Oakland police sent surveillance photos to my employer of me at the rally on Friday. I will tweet those pics next. The instance of @Anon4Justice’s tracking and firing, comes amid news that Oakland received $7 million, again from the Department of Homeland Security, for port security. Yet in addition to the use for ports, Oakland plans to spend the money on a vast surveillance “Domain Awareness Center,” as the ACLU of Massachusetts' Privacy SOS blog pointed out Monday. “From a central location, it will electronically gather data around the clock from a variety of sensors and databases, analyze that data and display some of the information on a bank of giant monitors,” the New York Times reported two weeks ago. The city maintains the center will help reduce crime in a city that sees more than its share. Yet critics told the Times the program “will create a central repository of surveillance information” and “gather data about the everyday movements and habits of law-abiding residents,” calling into question the legality and ethics of such an operation. The Times reported that this project is not the first time Oakland has sought to develop such technology. A city audit viewed by the paper revealed that lawmakers spent nearly $2 million in 2012 on police tools that did not work or could not be used for a variety of reasons. The center will be operational by July 2014, and will eventually cost $10.9 million in federal grants, the San Francisco Chronicle reported. 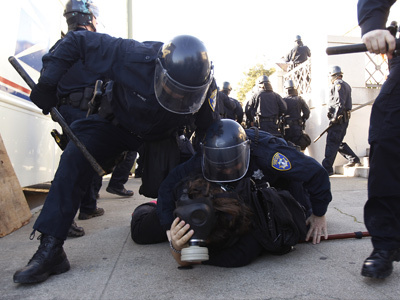 Oakland has been the site of contentious, at times violent, confrontations between police and protesters in recent years, and beyond. The City of Oakland and Alameda County agreed in June to settle a class action lawsuit by paying out $1.025 million to 152 people arrested in 2010 while protesting the leniency of sentence for a white transit officer who shot dead an unarmed black man, Oscar Grant. 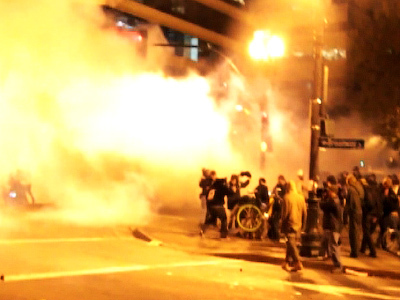 Occupy Oakland and police clashed many times, most notably in late October, 2011 as Oakland police attempted to clear its encampment and disperse hundreds of protesters, later leading to Iraq war veteran Scott Olsen suffering a skull fracture caused by a non-lethal projectile shot by police. 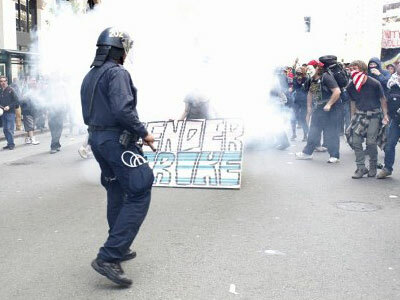 Tear gas was also used on protesters during May Day 2012. 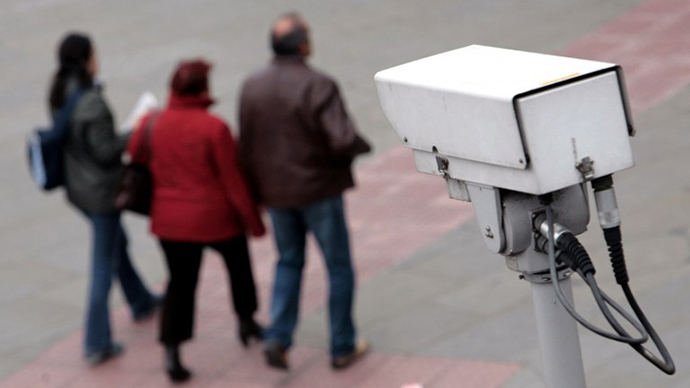 On top of the centralized surveillance operation, as Privacy SOS wrote, the allegations that surveillance data was used to undermine the exercise of free speech by @Anon4Justice could have a chilling effect among other activists. “This kind of government action sends a chilling message to all Oakland residents: If you protest the police, they will use the powerful surveillance tools at their disposal to come after you and interfere with your life -- regardless of whether or not you've done anything wrong.